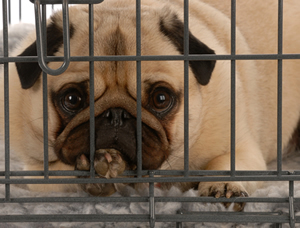 A few days ago I wrote about one potential danger in the use of wire crates for your dogs. Our situation has changed drastically in just the past three days and the update needs to be told so that others can learn from our experience and help their own dogs. Riley is taking us on yet another learning adventure into illnesses that affect dogs. Our poor guy just can’t seem to catch a break! First it was hypothyroidism, then it was his bi-lateral hip dysplasia and now this! Hey, Riley? Any time you wanna jump off the adventure-wagon is ok with me! Thank goodness your sister Nissa doesn’t like trips down Adventure Lane, I don’t think I’d have any hair left on my head if she did! Everyone knows that dog’s nails are no different than humans in that occasionally a dog will break a nail. Often you can pinpoint the cause of breakage or at least think you have it figured out. You may or may not actually see it happen. If you don’t see it happen, thinking back over what the dog was doing before you found the break you can often come to a common sense conclusion as to how it happened. This is exactly what we did but boy … were we ever WRONG! Normal nails are pretty darn strong and don’t break easily. If your dog seems to be breaking nails for no reason or something doesn’t seem right about their nail loss, please read on. Your dog could be suffering from a serious and very painful disease that needs immediate vet attention! Riley is now seven years old and up until the past six or eight weeks he broke one or two nails in that time frame. I’m not talking about breaking a nail near the tip where it doesn’t hurt. Think about how it hurts to break one of your own nails right down to the quick. You can wrap your nail and treat it with antibiotic cream, it still hurts but at least you can take steps to protect it from being bumped or otherwise irritated. When a dog breaks their nails down to the point of exposing the quick it’s very painful. There are nerve endings there that are now exposed and we all know how much nerve pain hurts! Add to that a dog’s nails are all on their feet which they must use all four of to get around. They walk through grass, snow, mud, sand — whatever — and this all rubs on the injured nail area, I can only imagine how much this hurts. 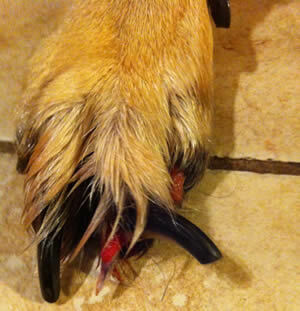 When a dog breaks their nails to the point of exposing the quick, the nail usually bleeds significantly. Ever try to keep a bandage wrap on a dog? It’s not easy. Most dogs will find a way to get that annoying gauze wrap off their foot and then they lick and chew on the affected area. The one or two previously broken nails (spread out over seven years) was disturbing because of the amount of blood, I never in a million years even considered there was an underlying problem. Not a bad average over time and nothing to get alarmed about, right? I felt really bad for him each time because I knew he was in a lot of pain but he healed up and all was well and I never thought about it again until recently. On June 1st I came home to a blood bath on my kitchen floor. Scared me good until I found the source of the blood, he’d broken another nail. I just followed the instructions I’d previously gotten from the vet and we contributed the break to him having mis-stepped and caught his foot on the wire crate. This explanation made perfect sense to us being that we know how he charges around performing his self-appointed duties as our “Head of Security” guarding the house. A few days later he lost a second nail off the same foot. We then moved to what we felt was the common sense cause that he didn’t just mis-step going over the wire, he must have caught his foot between the crate wires, panicked because he felt trapped and so fought to free himself. At this point I started to feel that something else was going on and I wrestled with that feeling and the human conclusion wire crate reason for the broken nails. It just made sense to us that having caught his foot in the crate and fighting to get out of the wire could have caused severe bruising and the loss of his nails because of it. Over the next week or two, his remaining nails began to to “pop up” and he then lost all nails on that foot and his middle toes on the left rear foot were flipping up when he walked at the “move yourself forward point” which started me thinking he may have something broken inside. I just knew something was not right and I wasn’t going to have a minute’s peace until I found out for sure. I mean really, us humans will manage to justify anything that makes sense to us because our dogs cannot tell us something hurts. Reality as we later learned was (as dogs will do) — Riley was hiding his pain too damn well! Oh how I wish our dogs could tell us when they hurt! We could help them so much sooner! Two vets told me he couldn’t have broken anything in his foot because he would not be able to walk on it. Trusting my gut feeling, I wasn’t going to believe anyone until they could prove to me nothing was broken so I insisted on x-rays. Two x-rays and a flouroscopy later it was confirmed — there was in fact nothing broken or disjointed. I thought I finally had peace of mind. I then managed to more or less convince myself I was just being paranoid and that he would eventually heal up just fine. Total vet costs at this point was almost $750.00 and me feeling pretty darn foolish at that point. A few days later we found a broken dew claw. Our human reasoning? He’d caught it on the chain link fence going off on another dog across the yards. Then a nail from the other rear foot broke and we were left scratching our heads for a reason and my gut was telling me that there was something more to all of this than just a run of bad luck for Riley’s toenails. A couple of days later a nail from his front foot broke. Ok, I’m done with this crap, and went on my own research hunt that very night and I’m still kicking myself for not doing so sooner! Since he had seen two vets already who both told me they couldn’t find anything wrong with him other than he’d “really done a number on his nails” it was going to be up to me to find out what was wrong with our Riley. I didn’t care how many vets couldn’t find anything wrong, my gut told me there was more to this than anyone had seen so far. 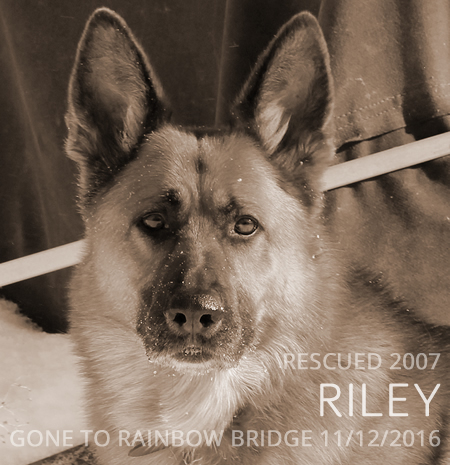 I keep in touch with Judi, the founder of the Central Wisconsin German Shepherd Rescue where Riley came from. I remember telling her about the (now we know human-sensical) crate incident to her and she thought it odd that he kept breaking nails and I couldn’t get her comment of my head either. OMG! What a Reality Check! The photo at the top of this article is *not* our Riley’s foot, however it is very similar to what his left rear foot looked like a few weeks ago just after he lost the two outside nails and before he lost the two middle nails. With permission to use it from the owner of this photo is from a post on German Shepherd Home. We thought the middle nails were just loose and taking their own sweet time to actually fall off and that they looked really long because they were loose and not seated where they are supposed to be. WRONG! I immediately printed and faxed three of the articles I found to our vet so she’d have them when she got in that morning. Due to the fact that there are other things that some of his symptoms could be (bacteria, virus or fungus) she consulted with the U.W. Vet Clinic’s Dermatology department in Madison, WI. We had to find out if a culture or biopsy was in order before proceeding. A biopsy would mean having to remove an entire toe! They told her to skip these because the only thing this could be is SLO, that there’s no point in putting Riley through these other tests and that we should just start treating it immediately. Being incurable means it can only be treated and managed for life. In Riley’s case the disease is progressing quickly and it’s obvious he’s in pain when he walks. I’ll be at the vet’s office when they open this morning to pick up the meds and get him started on his treatment today. Until he can show me he’s walking with no pain, we have discontinued our walks. He’d happily go on a walk and be excited about it, but I’m not about to intentionally put him through pain to do it. NOTE: If your dog is showing signs of this illness and your vet doesn’t look at SLO as a possibility, don’t be too hard on them. I learned this disease is considered to be rare and so it’s not known to many vets. I found what I consider an abundance of information on it so I’m surprised it’s considered a rare condition but rare is what was stated in a number of articles. German Shepherds, Rottweilers, Labs, Pit Bulls, Gordon Setters, Greyhounds and other large breed dogs are all supposed to be susceptible to SLO. There is more information on this on page 3 of this article; The Role of Breed in Canine Skin Disease and Brittle Nails in Dogs. The more I look, the more breeds I found that suffer from this. From what I can find the disease is not contagious so you shouldn’t need to worry that your other dogs can contract it if you’ve got a multiple dog household. Untreated it can lead to total lameness! If you have a dog showing symptoms it’s imperative that you find out if SLO is the cause and take immediate action! I’m going to start by reading all the posts on the Cooper Project website. It looks like there’s an enormous amount of information on this one single website. I plan to read it “cover to cover” just like you would a book and follow all links to other sites that might be mentioned in these articles. Our hearts hurt for Riley’s pain and we’re not happy that he’ll need lifelong medication to control his SLO, but at least I found the cause and he hopefully will be ok if we can get it under control quickly. When his nails grow back, they won’t grow back normally, they’ll be deformed. Not something I wanted to hear but the alternatives are much worse. Funky looking nails are the least of my worries right now. I hope that the first medications we try will do the trick, but for now that remains to be seen. It’s hard to know that it will take so long to see results especially since we may have to try several medications to find what works for him. The longer this disease is allowed to attack him, the longer he’ll suffer and the more chance there is that it will do damage that may cause him to go lame. I’m also learning SLO can damage a dog’s coat and there may be more but I’m just beginning my research. I’m hoping that because he needs a bath right now (groomer appointment scheduled for next week) that what I’m seeing as far as coat quality is only because he needs a bath. His coat is a tiny bit on the dull side which is not normal for him at all. I’m hoping a nice soapy bath and fluff job will fix that right up! On my husband’s request, I did ask our vet about what I considered an extreme measure of removing all his toenails as an alternative to lifelong medications. I wasn’t about to disregard the idea without checking to see if it was a viable option. She agreed this was extreme and recommended against it because you also have to remove the lower part of the bone in order to get the nail bud or the nails will continue to grow back causing a vicious recurring cycle of the disease. I can’t believe this extreme measure would not cripple a dog and/or cause other significant negative issues since he’d have to have all nails removed. I would love to hear from others who are going through this with their dogs. I wasn’t overly worried this morning but tonight I’m finding that this disease is uglier than I originally thought and the more I research the more scary it becomes. Do you have a story about your own dog’s SLO illness or information about Symmetrical Lupoid Onychodystrophy (SLO) that you can share with us? I took in a stray in January of 2015 her nails had been cut extremely short she is alittle over 1 year old we think. But her nails have been cracking n breaking off. The vet suggested that I put her on a omga fatty acid n she has been on it for several months. But her nails are still cracking n breakjng. Thank you for article about s.l.o. I will be taking her to the vet n have her checked. I feel so bad cuz I know she is hurting n would do anything to take it away for her. This dog was abused n had been threw so much the 1st 6 months of her life but has been spoiled rotten since she has been with me the past 10 months n I love her with all my heart n only want the best for her. My sweet pea is one of kids as is my other dog mattie n my 3 cats. You’re very welcome, happy to be of help. Hope your girl is doing much better now. La_famiglia36. I post mostly about my dog and some of his struggles with his nails. I am private but I usually except requests. It would be nice to see and hear what others are doing for their pups. I’ve never heard of Welactin so can’t comment on it other than it’s not in the protocol we had Riley on. I would suggest you read my follow-up article on SLO called What We’ve Learned About Symmetrical Lupoid Onychodystrophy. There are several different protocols people and their vets are using and trying. It sounds like you don’t have the right medication and/or supplements to me but I’m not a vet. Vitamin E paired with Salmon oil is one highly recommended. We now give him Henry Schein Omega Tri-V Caps in place of the Salmon oil but Riley is not currently nor has he had any flare-ups since the first one and so his protocol changed after a couple years in remission. SLO flare-ups are very painful! Booties are somewhat controversial. We never used them, found them to be more uncomfortable and comfortable for Riley because the rubbing of the fabric against the raw nails was very painful for him. He’s not one to like people (or anything else) messing with his feet, he never has SLO or not. You say he went several months without an issue then he went into another flare-up. Did he receive any vaccinations between the flare-ups? I ask because over-vaccinating is a trigger for SLO and is what triggered Riley’s SLO. I would be very careful about sedating your dog just for nail clipping. If there’s any safer way, I would take it especially because a dog’s nails need clipping so often. That’s a lot of sedation! Sedating a dog is absolutely nothing to take lightly, some dogs don’t come out of it. When Gracie was spayed our vet had an extremely difficult time waking her up and warned us about any further sedation so unless it’s absolutely necessary we won’t sedate her for anything. I’m not aware that coconut oil is helpful specifically for SLO but it can be very beneficial all around. We use it every day for our furkids. I’m so sorry but it does sound to me like Snoopy has SLO. 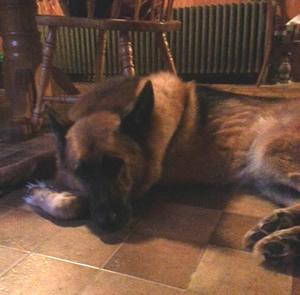 If in fact that’s the case he’s likely in serious pain so I hope you won’t wait too long to get him to the vet. In the meantime you could start him on the supplements – Niacinamide (not niacin! ), the fish oil and vitamin e. Most dogs do well on supplements alone forever after the flare up is over but the antibiotics are necessary for the active state but that is most dogs not all dogs and there is no way to know ahead of time what category any dog will fall into. You can also get some Epsom salts which is quite cheap and do foot soaks for Snoopy which will help ease his pain. Be aware that your vet may not be familiar with SLO, many general practice vets have never heard of it. It’s a good idea to go armed with printed copies of your research along with photos of dog paws of dogs with SLO. You can get these by visiting Google Images and searching, then print out a few pics. If he doesn’t know what it is, insist that he consult with a dermatology vet – they are the ones in the know about this disease. If he’s a long time family vet and knows your situation perhaps he can give you some ideas or suggestions on how to get the meds at less cost. The supplements are not expensive and with the Walgreens card Riley’s doxy was only $40 per month. We have pet insurance so we got reimbursed $32 monthly for that so the doxy was only $8 a month. You could click over to Healthy Paws Pet Insurance and get a quote on pet insurance for Snoopy. There are other pet insurance companies but my research found that Healthy Paws has the best coverage without limitations on how much per lifetime. There is a two week waiting period before the insurance kicks in and you have your choice of three deductibles. It works on a reimbursement basis and there would be the initial deductible that you’d be responsible for every year. How much that is depends on what policy choice you make. Please read and understand the rules before you go too far into the application process, kind of like reading the small print. There is a sample policy on their website so you can read the entire policy before you commit. Another thing you could look into is a Care Credit card. Any vet bill over $200 you get six months to pay interest free but remember if that bill isn’t paid in full by the due date you will be charged interest from day one. It’s a credit card dedicated to pet care and vision & dental care for people. You might also check with your local humane society and cat rescues. They may know of other ways to help people in your situation cover vet costs. As for declawing Snoopy please please please don’t do that. In order for the SLO to go away permanently they have to remove the nail bed which is the same procedure as declawing a cat. Please at least read the part of this article What You Need to Know About Declawing. The third paragraph explains this barbaric, painful and potentially crippling procedure. Many vets are now refusing to declaw cats unless there is a medical reason for it. I urge you to join the SLO group at Yahoo and also read my followup article What We’ve Learned about SLO and all the posts following the article. I think it will help you to learn from the discussion participants, there is a lot of useful, educational information to be found. I also suggest that you read the articles on rabies shots and vaccines. I’m only guessing but at Snoopy’s age he may have been over-vaccinated which is a trigger for SLO. Here is one to get you started called Vaccinating Your Dog. Learn Before You Poke! I hope everything works out ok, please keep us posted. Our best to you and Snoopy. We are just now starting the education process. Our Lab/pit mix is showing the signs. Two nails removed in 90 days and others are splitting and bleeding. Another appointment tomorrow to see what the vet came up with but SLO sounds like it. Heartbroken! We wish you and your furkid all the best and hope you get this under control quickly! I learned awhile back that the cost of meds pretty much goes right along with the cost of living, it’s geographical in many cases. Tetracycline was never mentioned for Riley, we use the doxy as do many many others. I wouldn’t stress over not being able to afford the tetracycline, doxy is in the protocol for the disease. All is well. Good luck with your pup! I have been using superglue to keep the nail on as lone as I can, giving the toe/nerve a chance to crust over while being protected by the glue. I have not yet received a medical opinion on this method of avoiding the sensitivity of losing a nail. After the nail is totally gone, I paint the toe with black fingernail polish for a more natural looking protective coat. It seems to me that by putting superglue on your dog’s nails is only going to prolong the nail falling off at which point they start to get some relief. Before I would do something like this I would definitely get my vet’s input and I’d make sure it’s a vet that’s savvy on SLO (which isn’t easy to find) and not just do it. I personally don’t care how my dog’s nails look to me or anyone else, they don’t have to be black or any other natural color and would never apply polish for any reason but I know some people find this practice very appealing. I won’t go into my own personal opinion on painting a dog’s nails. If you feel you absolutely must paint your dog’s nails, I hope you’re using pet nail polish and not human nail polish. Have a look at this link: Is Nail Polish Bad for Dogs? and this one: Can Nail Polish Harm Your Pet? If the nail is gone, are you not painting the quick? Imagine the searing pain if you put nail polish (which contains alcohol among other nasty things) on your own raw skin? The quick is very tender (which is one reason SLO is so painful because the quick is exposed) it’s like having an open wound on your own body. I can’t imagine doing this to my dog, I just can’t but I would imagine you’re not a lone soldier either. I sincerely hope your dog is under veterinary care and treatment for his/her SLO. Omg my pit bull Sammy has lost 6 nails 5 on the left front and 1 on the right foot. I have been to the vet 3 times and this last time I was told it was Pododermatitis. I need some help. I have done everything to keep him from getting a infection from warm antibacterial washes 2 times a day and after washing his feet I squirt Apple cider vinegar to help with the itching then i mixed water and iodides tincture in a spray bottle. Then I put some steroids cream the vet gave me then neosporin then wrap his foot with gauze and then the baby socks. I might be over doing it but this is one scared momma. No infection thank goodness. Sammy seems to walk around the house ok specially since the nails that were loose feel off. I guess I need articles to give to the vet to educate him so he will get Sammy on the right meds. Any words of wisdom would greatly appreciated. I’m sorry to hear about your dog and it does sound like SLO to me. All the fungus, infection and antibacterial washing will do nothing to help him. You have found good resources here so read up and continue to research by Googling for Symmetrical Lupoid Onychodystrophy and SLO. Print and take to your vet. Best of luck to you! Thank you for your kind words about my blog, The Cooper Project. I’m sorry your dog is going through this. It is indeed heartbreaking. Great to have you here, thanks so much for your posts and sharing your information. All of us who have dogs with SLO need as many resources as possible in order to best help our furkids and you’ve just helped all of us with your input! Yvonne, Could you please tell me what food it is that you are feeding Meeko, and seems to be the right one! We are currently having great difficulties with our 15 year old Corgi. We’ve been back and forth to the Vet, never getting anywhere. Through research online, we finally found out about this SLO, and believe this is what we’re dealing with, as well as food allergies. We have an appointment w/ the vet tomorrow, and plan to go armed with info that may finally help our sweet girl. Thank you very much for any help you can send. Cindi. We found Performatrin Senior. The lamb and rice variety. The younger dogs are on the Performatrin Ultra Lamb and rice. We chose to switch them to the similar food, just to make sure we don’t have any cross contamination if he decides to sneak from the others. We tried so many different types of food. We had good success with with Wholesome Blend Grain and Poultry free. (until the SLO) It worked great for his allergies. (no bowel issues, no skin flareups, and his ears stayed nice and clear). We know he can eat some grains, but were never able to figure out which ones were causing issues (along with the poultry). Sorry I didn’t see your post earlier. I switched internet providers and it took a while to get them back up and running. I hope you made out well at the vet’s and your girl is feeling better. Mom: Meeko is now off the tetracycline. He’s lost almost all of his nails now. I only see one there and it’s very short, so it may be a nail growing back. We are keeping with the Niacidimide and Omega 3 supplements. We notice he is walking back up on his feet for long periods of time. For the last year, we thought he was having front hock issues and he was wearing supports: now we realize that perhaps it was the beginning of him having sore toes and avoiding to walk on them. He’s starting to play with the younger dogs and he even tried to climb on top of the garage roof with them yesterday. (Yes… that’s how much snow we are having…. UGH). And…. I’m excited about this… He let me touch his paws and toes the other day!!!! I don’t know right now if I will be trimming them once they get long enough. He is exceptionally trusting… but if I notice it hurts him, I will probably choose to have him sedated to get them trimmed. I am very lucky his nails have always been extremely slow to grow and I’ve only ever had to trim his nails a few times a year. (Not like the lab that needs to be done every few weeks). That is what surprised me when I saw how long they got… it was very unusual to see nails of any length on him. I’m wondering if it’s because he was avoiding walking on his toes, that they didn’t wear off. I’m keeping my fingers crossed and hoping, the vitamins and new food continue to do the trick. Riley, too, has got much longer nails than ever. We *never* had to clip his nails before he got SLO. Now we have to keep after them. He still doesn’t like anyone touching them but then he never did, even before SLO. Just more so now. As for sedating to clip nails, I personally would use this as a last resort. Sedating has significant dangers and as often as a dog needs their nails clipped that’s a lot of sedating even if it’s the “twilight sleep” kind where they’re not really out just kinda floaty. We have our vet clip his nails whenever possible. It costs extra but we like the idea if he starts bleeding he’ll be in the right place rather than home. Hope things keep going well for you! My 11 year old German Shepherd Meeko was diagnosed with SLO 5 weeks ago. So far he has completely lost 7 of his toenails. Another is about to fall off anytime now. He was put on tetracycline and Niacidamide three times daily along with an Omega 3 supplement once a day. I’m lucky with the cost for the tetracyline is only about $30 a month and the niacidamide is only about $6 a month. I have noticed a huge decrease in his pain level over the last few weeks. I’m not sure if that is the medications working or the fact that now that the nails are off, they are not pressing on his quicks. I’m hoping that if we can get him healthy enough, we will be able to reduce the amount of antibiotics and Niacidamide he is taking. However, my vet told me he would most likely always be on some sort of regimen for the rest of his life. He was on Medicam for the first week, but is doing well enough that we haven’t had to refill the prescription. I am happy to say that I’m am very pleased with my vet. I called as soon as I realized his nail fell off and she saw us that afternoon. She did her research and by the next morning, had answers for us as to what was going on and had a plan of action for us to help him. That morning, we had him sedated and she trimmed all his nails back as far as she could with the hope it would help both his pain level and hopefully help prevent the other nails from falling off. They fell off anyway but the fact that they were so short did help him walk a lot more comfortably. I started wearing children’s socks on him to protect his toes but he is an expert at pulling them off. Next task is to convince him to keep booties on once the snow starts. I am happy to report that he asked to go for a walk for the first time in months this week. I can tell he still is in pain, but obviously not nearly as much as he’s now going up and down the stairs on his own and is a lot more alert. Meeko has always had an autoimmune disorder and is extremely allergic to many foods (poultry being a major allergy). He has been partially blind since he was 4 because of pannus. He did have IBD when he was young, but once we found a 100% poulty and corn free food, that cleared up. The only outbreaks he’s had with IBD in the last 7 years was when someone snuck him food from the dinner table. (we have to be very strict with what he eats). We just started him on a new senior variety of food. (not easy to find with no poultry or poultry binder used). This variety is giving him a higher dose of glucosamine and MSM, so it’s possible that it could also be the reason for his reduced pain levels as well. The vet wanted us to use a brand of food they provide (for allergies) , but because of the poultry allergy our choices were reduced to 2 types. One had corn (another no-no), and the 2nd has brewer’s yeast which triggers his ear infections. So far, this new variety is agreeing with him and I’m hopeful it will work out for him. I’m wondering if anyone could tell me what will happen once the nails grow back. Is this going to be a repeat vicious cycle? I’m trying to get him used to a nail dremmel with the hopes of keeping the nails super short. But at age 11, he’s not accepting the new item well. This could be though because his paws are so tender, he doesn’t want me to touch them anymore. I don’t think anyone can say for sure if you and Meeko will be on a merry-go-round or not. Riley hasn’t had another flare up since his original one and we’ve kept him on the anti-b’s. There are (at least) two schools of thought on lifetime anti-b’s with the other being weaning them off. I’ve read some dogs do just fine after being weaned off the anti-b’s but being kept on the supps and don’t repeat the flare cycle, others flare again once weaned off and there are many stories in between. I’m literally afraid to take Riley off the anti-b’s because they *may* be why he’s not gone through another cycle but we have no way of knowing. I was getting serious about taking him off but something stopped me. Again more than one way to look at things, as always. Some say that the doxy is a gentle antibiotic as antibiotics go and that this gently keeps the immune system from finding some where on the body to attack and keeping the immune system balanced is very important. Our vet tells me that anti-b’s work differently in dogs than people. In people they become ineffective when used long term, but that’s not supposed to be the case in dogs. We are at the point so far we’re not messing with what works and so Riley stays on the antibiotics and his supps. As for the dremmel, Meeko’s reaction doesn’t surprise me. It’s noisy and it vibrates which feels funny to him and it could actually be painful. If he were my dog I would not push the dremmel. I also don’t know that keeping the nails really short is going to help. It could be that if he flares again he’ll just have shorter nails when it happens. As I understand it a nail is a nail and SLO doesn’t give a rat’s patooty how long the nail is if it’s going to attack it’s going to attack. Hi RIley’s Mom. I am Lilly’s Mom. Lilly is the world’s most perfect Rottie. She recently turned five. A little over a month ago she broke a nail. First time. I thought it was no big deal. Took her to the vet, put her on antibiotics, easy peasy. In the last five weeks she has broken 8 more nails and now three out of hour of her feet are infected where she lost the nail, because they did not have her on the right antibiotics. I had this gut feeling after she lost the third nail that something was wrong. Every time I took her to the vet, the vet told me that her nails had just been cut too short at the groomers two weeks prior and that is what was causing this. I called and went in every time she lost a nail and every time a quick wouldn’t heal and again they told me there is no disease that would cause this, her nails just need to grow out and I just needed to be patient. Today she lost another nail. I showed them articles from the internet and now they want to amputate one of her toes to run tests. Isn’t there another way to diagnosis it without cutting off one of her toes? Hasn’t she been through enough. The Vet, after we lost the 8th nail now believes it is SLO, and states that once it is done with the feet SLO can start attacking other organs and parts of the body. Is this true? It is hard to trust a vet who for five weeks made you feel like a helicopter Mom and kept telling you to calm down and be patient and it would heal itself. How do you now trust those same doctors to save your fur child? I’m sorry to hear about Lilly’s SLO and hope she gets to feeling better very soon. When our vet consulted with the dermatology vet, she described the symptoms verbally by phone. I’d given her photos to email them as well. Their response was that they didn’t need the photos, the verbal description could only mean one thing, that Riley had SLO and that we should start treating him immediately. The medications we give for SLO are not considered harmful and if they didn’t do the trick we’d have to move onto something else. When the meds worked it just proved the derm vet was right so no biopsy was needed. From what you’ve told me and your vet (finally!) suspecting SLO, if Lilly were our dog we would not do the biopsy (amputation) unless it came down to being a last resort after other things were tried and failed. But that is us and our dogs and I’m not telling you that you should just take my word for this nor to just blindly do as we did, you have to do what you feel is best for your dog. I’d be frustrated and po’d as well being told to calm down, be patient and it would heal itself. To me that’s a pretty darn arrogant attitude when (my opinion) the vet who quite obviously didn’t have a clue what this was should have been doing his darndest to find out. It bothered me but I didn’t get overly concerned when Riley lost the first couple of nails because there was a logical explanation for the how and why. Heck, it’s not unusual to break a nail, right? But there comes a point where enough’s enough and had your vet done some research and consultations with other vets he might have been able to diagnose Lilly sooner. Being blown off is never a good feeling. I have a real hard time with vets or people docs for that matter who when they don’t know what something is they don’t bother to find out and instead assume it’ll go away on it’s own. Vets deal with a lot of pain and suffering and I think for some they have to detach for their own sanity or maybe they’ve just have been a vet for so long that they get cold and callous. I don’t know if that’s the case or not with your vet but in any case it sure isn’t justification to patronize and blow you off in my mind and we should not have to do their jobs for them either. As for it being “done with the feet and moving on to other organs and body parts” … that’s not quite the way it’s been explained to me nor did I find it explained like this in my research, but I’m not a vet. This is how I understand that it works. SLO is just one of many auto-immune diseases. Once a dog’s system has been compromised other auto-immune conditions can continue to crop up but once SLO is into remission it’s not like shutting a door on the feet and opening another one to another body part. We continue to give Riley his SLO meds in the hopes of preventing more SLO flare-ups, we were told he will need to take his SLO meds until he dies. The medications he takes are specifically for his SLO and so far he’s not had another flare-up. I was never told his SLO medications could/would also prevent other body parts being attacked but I suppose they might be without us or the vets knowing it. However, because his body is already compromised we should not be surprised if other body parts become victims to another auto-immune condition. I just posted the story about Riley’s newest medical issues today which is Inflammatory Bowel Disease (IBD) and IBD is possibly auto-immune, however this is not a sure thing because other things like genetics and allergies may be involved. From what I’ve found, the medical community cannot yet point a finger at any one reason a dog gets IBD but auto-immune is in the mix as a potential. Riley has hip dysplasia (genetic) and SLO (auto-immune) which I have absolutely not a single doubt came from having been over-vaccinated triggering the auto-immune condition. I’d have a hard time trusting as well, we did in fact switch vets but that decision had nothing to do with Riley’s SLO. She didn’t know what SLO was, I researched and gave her what she needed and she immediately went into action to confirm it and to find out what to do about it. I cannot fault her for the way she handled Riley’s SLO. My feeling is that if one is not comfortable with their vet, they need a new vet because trusting one’s vet is a life’s necessity for our pets. We have to trust they work in our pet’s best interest and if we don’t think they are, we need to find one that will. OMG… I googled this because our German Shepard “Gunny” started losing his nails and the picture above sadly looks exactly like his. I’m taking him to the vet in the morning. He was a very active and rambunctious guy until recently which I can only assume is due to his discomfort/pain. This really hurts us as we had a bad experience in the past with another shepherd that past away from parvo virus many years ago. Has anyone found anything that will help over the long term? Is this a life threating disease? I’ll try and stay in touch with everyone as this is a member of the family that is now going to require long term care. First of all, please relax. SLO is not a fatal disease. The only way I’m aware of that it could become life threatening is if it were to go untreated and your dog goes lame. Without the ability to walk, most people would put their dog down. You’re concerned and you’re looking for answers. The big thing is to get your dog to a vet so he can get treatment. Be forewarned though, SLO is still considered a new illness so some vets aren’t familiar with it. Do your research and take it with you to your vet. Ask him to consult with a dermatology vet, these specialists are the ones who know the most about the disease. Yes, your dog is in severe pain so he’s going to be different. Riley spent most of last summer laying on the floor, he didn’t want to do anything because of his pain. If you get treatment for him, he should be fine. His nails may not grow back normally. We don’t care what his nails look like as long as he’s not in pain and he’s not. We do believe his feet are more sensitive to cold in the winter so we keep walks shorter and don’t allow him outside for long periods of time. Both of these are designed to help keep him for being in pain. The treatment Riley is on is long term, in fact it’s probably for life unless something new and wonderful comes along. His antibiotics *would* run about $600.00 per month at current pricing. However, don’t freak out just yet. If you can, get your dog’s antibiotic prescription filled at Walgreens. They have a program (plan?) whereby I register once a year for their “W” card, yes just the letter W. Use of the card drops the cost of his prescription to just $40.00 per month which obviously is much more manageable. The supplements (vitamin e, niacinamide and his salmon oil) I order online from Puritan’s Pride and Vitacost and they’re very cheap. Please reread my posts on this because they will tell you about making sure to get niacinamide (no substitutions) and give you other info. I also sent an email to my vet’s office asking them to check into the Pentoxifylline which was mentioned in other posts by people using it, but I don’t have an answer from my vet yet. You are welcome to come back here if you have any more questions. Your pooch will be ok long as you get him to the vet and on the meds and supps he needs! So, smile and just do it and you’ll both feel better! Come back and let us know how it goes, ok? Great hearing from you again, hope all is going well for you! Yeah, it’s been heartbreaking here the past couple of months. Day before yesterday he had a bad day but yesterday he had a good day — not great but good. We even were able to go on a half hour walk. I think he may have gone longer (he didn’t tell me he wanted to go home which he does) but I didn’t want to push it. There are two nails in the process of coming off and soon will be painful for him. One of the worst things is that had I known more about the consequences of vaccines I would have stopped their vaccines after they were a year to year and a half old and this probably would never have happened. Our country really needs to smarten up about over-vaccinating our dogs! Thanks for the link, but for now I’m going to stick with what the vet and others who deal with this disease tell me to give him. I don’t want to take a chance that something might not play nice with his meds. I’ll share the link though, might get some good feedback that will prompt me to try it. Take care, Brenda! So glad you came to visit again.